Since I am not a fan of riding high and fast rides in amusement park, we all went on a monorail ride. 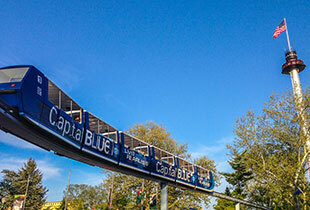 Monorail is sponsored by Capital BlueCross. It is an elevated monorail which offers riders an audio tour while viewing Hersheypark, ZooAmerica, and downtown Hershey. The photos above is the ride called the Kissing Tower. It is an enclosed cabin that climbs 250 feet and rotates in a clockwise direction. It provide the riders a panoramic view of Hershey through windows shaped like Hershey's Kisses chocolates. You have to pay an extra fee to go on this ride. We did not do it. It was a relaxing ride after a huge walk at the park. My daughter wasn't thrilled because it wasn't fast but my son and I enjoyed it. I got the chance to look around without getting dizzy or getting sick to my stomach lol. It also gave me a chance to take pictures from an elevated location. Just looking at the rides makes me dizzy already so I don't really understand how people could enjoy such a thing lol. I think I would have a heart attack on this thing. I mean look how much yo]u will drop! Going on a monorail ride really gives you that ipportuunity to look around not only inside the park but you will also glimpsed part of the Zoo America and the downtown part of Hershey. So glad that they took me to this monorail ride. At least I get to enjoy one thing at the park lol. 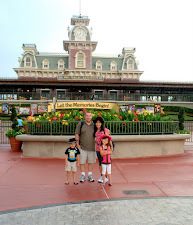 We would love to go back there again sometimes. We had a grand time out there. I mean for just two days, we did so much! We did this about a dozen times when we were there in July. It was an interesting ride and plus it was a nice break from the walking. It has been many years since I have been to Hershey Park. It's about time I go there again. I bet a lot has changed. Oh my, I haven't been to Hershey Park since I was a kid, many many moons ago. It sure has grown up! Wow. I love roller coasters!! I have always wanted to visit Hershey Park! Thank you for sharing your awesome experience with us! It sounds like the ride you can take at Sea Workd where you get to go up and see the whole park and oven from the top of it in panorama. I love scary roller coasters. I'm thankful adulthood hasn't changed my thrill seeking nature. Aww looks like everyone had such a great time. We haven't been there yet but want to visit someday. Looks like a great family day you guys had! I'm not a big fan of fast rides either! I know my hubby and son would have a blast there! We just love Hershey Padk!! So sad we didn't make the trip this year. Next year it's a must!